Tick bites are normally of minor consequence; however, ticks are important vectors. Dermacentor sp. are hard ticks and transmit the agent of Rocky Mountain spotted fever. 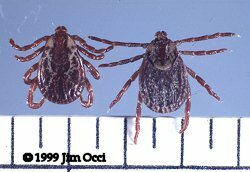 D. variabilis, the American dog tick, is shown at right (male and female).